Being Retro: Anime Central: WELCOMES YOU! May 17th-19th 2013 "Special Announcement"
Anime Central: WELCOMES YOU! 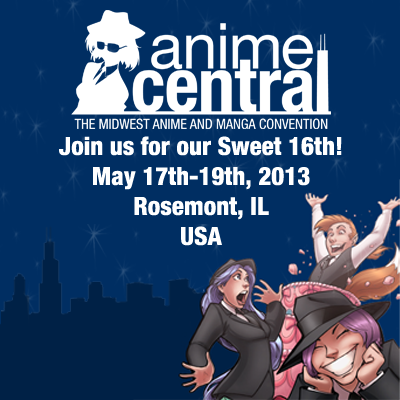 May 17th-19th 2013 "Special Announcement"
Anime Central (ACen) is Chicago’s and the Midwest’s largest anime, manga and Japanese popular culture convention. The convention is currently held in Rosemont, IL, less than 30 minutes from downtown Chicago. Attendees can attend a dance with 5,000 of their favorite friends and cheer while amazing DJs spin, enjoy an incredible concert, or visit the largest artist’s alley found in any US anime convention. I cannot believe it's all ready here, I am set are you set Chicago and surrounding suburbs?Guess who is going to this weekend, yes I know "Star Trek: Into the Darkness" is starting... I am going to work around it. So stayed tuned to this and "Howlin' Wolf" for all the coverage, you know I love a good cos-play! The Con only happens once a year - go!! I've never been a huge fan of anime conventions, but this one looks pretty good!